Braun is one of the most well-respected shaver brands, the height of German engineering when it comes to shavers. They have a wide range of products and the Series 7 is one of their premium lines with outstanding features that will provide you with the best shaving experience. The Braun Series 7 Beard Trimmer is fully rechargeable and washable, so you can forget chords hanging out of the bathroom socket while you trim your beard. It is a very low-maintenance machine which can make your shaving experience not only shorter, but much more comfortable. 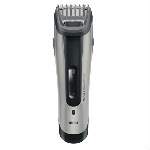 The Braun Series 7 beard and hair trimmer has a sleek black and grey design and comes with a compact unit. While it might not seem like a lot, a compact unit can help with presenting your bathroom as a clutter-free space. A shaver lying around with a cord hanging from it is not a good look. 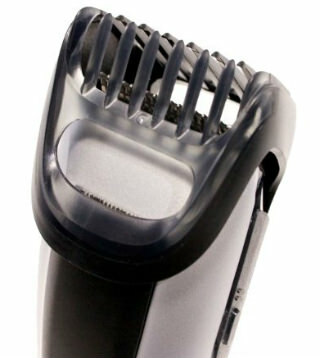 The beard and hair trimmer is adjustable to all lengths of hair on the head, or beard on the face. Its on/off button is located on the front middle panel, with a LED indicator light showing when it’s been turned on. Now that we are over appearances, let’s go on to the technical side of things. 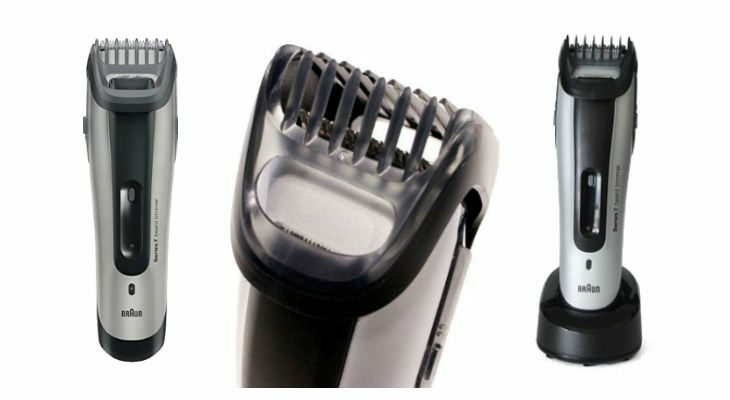 How can the Braun Series 7 Beard Trimmer make your shaving experience better? The Braun Series 7 is adjustable to all length of hair both on the head and the face. This shaver has a compact design which makes it sit comfortably in your hands. It is relatively small and have steady grip. While this model of the Braun Series 7 line is primarily a trimmer, it has so much more to offer than just trim your beard. It can be used to trim hair on the head, trim beards or shave off beards, and to maintain facial hair styles such as a goatee or a moustache. It can also maintain a certain level of stubble, or remove it completely. It’s powerful enough to provide a clean fast shave, but is compact enough that you will be able to trim to exactly to the style that you want. Men who also maintain short hairstyles will appreciate how they can use it to clip the air on their head, and the specially sized comb styles make maintaining the perfect length much easier. The Braun Series 7 Trimmer combs have a ‘Slide and Style’ system that enables them to easily slide up and down for the desires setting. This way, you don’t have to worry about the shuffling of the combs. They click and lock, ensuring a steady and firm position even during trimming. It also allows you to trim your hair or beard to the exact desired thickness. Having a trimmer that’s combs stay in a locked and firm position is really a must to prevent all the frustration that a shuffling trimming comb can cause. The comb is very easily adjustable. You simply use a finger to move the comb to the length that you require. There is a wide range to choose from. There are two different smart trimming combs that provide twelve different choices of hair lengths. This trimmer should be ideal for most men, and it’s not necessary to own more than one hair trimmer. So you can save space on the bathroom counter or in the bathroom drawers. Just some of the hair lengths to choose from include 1/8 of an inch, and 3/4 inch lengths of hair. The Braun Series 7 Trimmer is very low-maintenance. It can be easily washed just by placing it under a tap of running water. After, you just shake the excess water out and dry it with a towel. The shaver is also waterproof so you can take it with you in the shower to make the cleaning process even faster. The removable combs can also be washed separately if you don’t find it necessary to wash the whole machine after a quick trim. Shaving in the shower or over the sink can also make the process of hair trimming much simpler, so that hair doesn’t get all over the counter or floor. Men may wish to wipe out longer strands of hair from the sink to prevent the pipes from clogging. 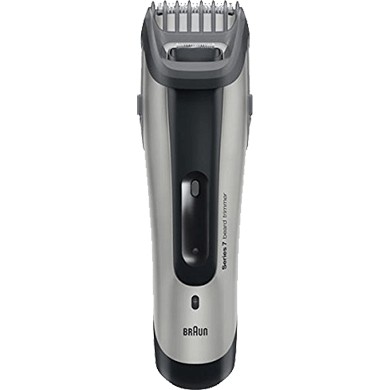 The Braun Series 7 trimmer is equipped with a long lasting Ni-Ca battery and a dual battery system which enables it to drive on twice the amount of power than similar beard trimmers in its range. This battery never falters, even when the power is starting to run low and its system provides for a longer battery life. The Braun Series 7 Beard Trimmer can be easily recharged by sitting it on top of a black recharging station. It only takes an hour to fully charge up, and that gives you about forty minutes of hair and beard trimming time. The recharging port is located on the bottom back of the trimmer. You’ll appreciate how little room it takes up when standing on the counter. It sits upright in the charger, so most men are certain to find a corner near the outlet to get it charged up, on even the smallest of bathroom counters. Most men will appreciate how they can rest it on the charger after shaving each day, to ensure that the trimmer is always fully charged up. This will not damage the battery at all—most modern rechargeable battery packs do not suffer from being overcharged nowadays. A Smart Plug is also included with the Braun Series 7 Trimmer, which has automatic worldwide voltage adjustment from 100 volts to 240 volts, depending on which location you’re in. It’s also a compact hair trimmer, so it will fit nicely into the smallest travel bag, or even into a backpack or a briefcase. You can have a good shave even when travelling. It might not even be necessary to pack the charger as the Braun Series 7 can be charged up for forty minutes of shaving. This way you can save space in your luggage and have a worry-free travel, in terms of shaving. The Braun Series 7 Beard Trimmer is available for around $150. It’s manufactured in China, but Braun oversees the process, so you’ll still be getting the good solid trimmer that Braun is known for. In the package you get one men’s Braun hair and beard trimmer, in Series 7″ BT 7050 & Type 5417, the charging stand, and a travel case to protect it while travelling. The entire set weighs three pounds. You might want to consider purchasing this product to replace and old and worn out hair trimmer from another brand or manufacturer. Usually, once people switch to Braun they appreciate the professional quality and endurance of the Braun design and never go back. You’ll find this is an excellent hair and beard trimmer, and it is well-made, which is what one expects from Braun. You’ll find that the trimmer is durable, and will last beyond the warranty. This is one of the best beard trimmer. The reviews back this up. The price may be a bit higher than you’re used to, but the German engineering and design make it worth the price.